It’s not exactly a mystery why robot vacuum cleaners are so popular right now. I mean, they’re robots that clean your house — does it get any better than that? Of course, since robot vacuums are so popular there are a million different models and it can be difficult to know which one to buy. If you want to best possible model and you’re willing to pay the price, the ECOVACS DEEBOT OZMO 930 is as good as it gets. Of course, not everyone wants to spend $600 on a robot vacuum, even if it is the best in the business. 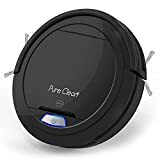 If you want a basic robotic vacuum that does a good job with dust and dirt on both hard flooring and on low-pile carpet, definitely check out the PureClean PUCRC26B Automatic Robot Vacuum Cleaner. At just $99.99 on Amazon, it’s a bargain and a half. ALLERGY AND PET FRIENDLY: the automatic vacuum cleaner’s HEPA filter keeps fine dust particles trapped inside the easy to clean removable dustbin – The bot features a no brush design and powerful vacuum suction does not clog with dog or cat hair like the units with a rotating under brush.